So let's make this card! I cut the globe die pc. 4 times. I cut 2 from white cardstock and one from brown cardstock. The last one was cut with a transparency. On one of the white ones I colored a sky with PanPastels Ultra Marine Blue. I cut both the "house" and the "church" from white cardstock and colored them with Copic Markers. I adhered both to a pc. of yellow cardstock and trimmed the excess off to look as if the lights were on. I cut all of the trees from white cardstock and colored the bottom of each with a little green Copic Marker. I cut the snowflakes with white cardstock and added a little sparkle with some clear Wink of Stella. Cut the Noel pc. with silver mirror cardstock. 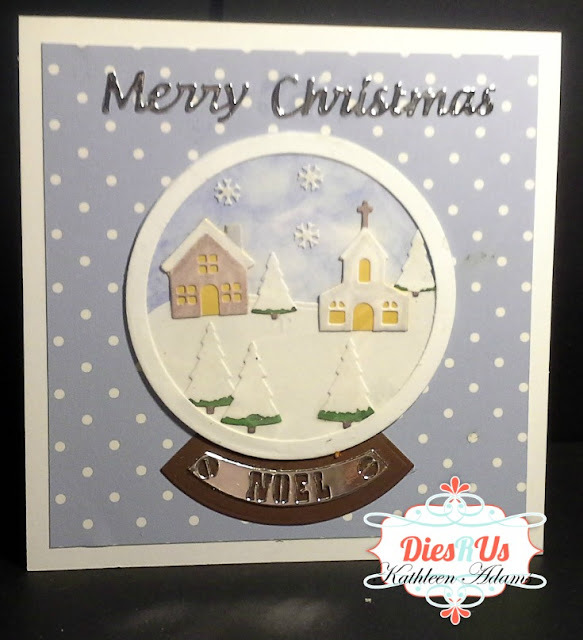 Cut "Merry Christmas" from this die set from Elizabeth Craft Designs 944 - Merry Christmas from silver mirror cardstock. Assemble the globe by adhering the white globe that you colored a sky to the brown one. Now, create your little scene by adding the white pc. that is the snowy hill. Add the house, church and trees as you like. Cut the base part off the transparency globe and adhere it over your little scene to look like glass. There are several circle dies in the set. 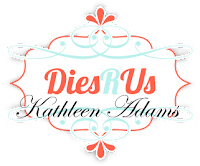 I nested two circle dies to make the white border. Adhere this white border next over the transparency. Now adhere this completed globe to the brown one and then add the silver Noel pc. to the stand. Make a base card by scoring a 8.5 x 11" pc. of white cardstock at 5.5". Fold over and trim to a 5.5" square. Make a 5" square from some designer paper and adhere to the front. Now adhere the finished globe to the card and the "Merry Christmas" sentiment. That's it. I hope you'll give this adorable die set a try! Thanks so much for stopping by today and I hope you'll come back tomorrow for more inspiration from the team. Cute holiday creation Kathleen! Thanks for holiday inspiration .. I need to get busy or I will certainly run out of time! Well done!